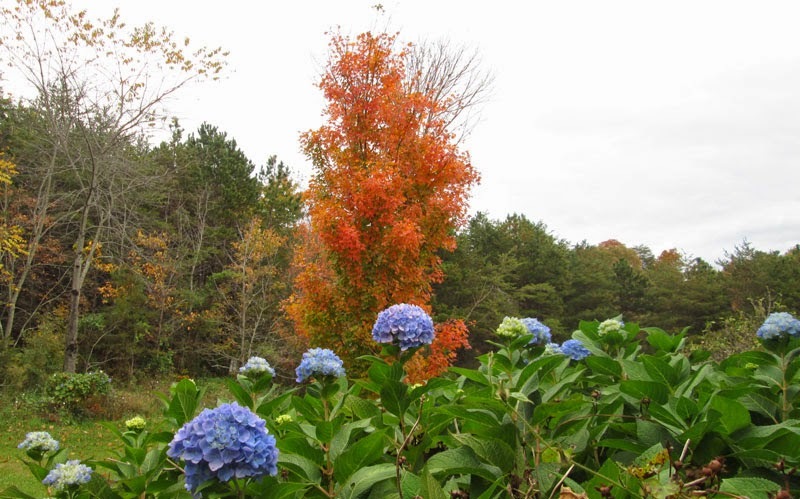 Lisa E Design Blog: Thankful30 - the hydrangea bloomed! Looking at this photo, you might wonder if it is spring or fall. Actually I took the photo for precisely that quandary on a layout. While our hydrangea bushes will have an occasional late bloom, what makes this year unique is these are their only blooms - in October. We had a late frost that bit back everyone's hydrangeas so I was delighted to enjoy a month of beautiful blue blooms this fall. They make such a pretty mix with the orange maple, don't they? So this will eventually end up on a layout, it seemed the perfect time to share it and add to one the many things I'm grateful for - having lovely flowers in my yard for at least 7 months per year. Which months for which flowers may vary. This photo has to be showcased on a layout, it is stunning.